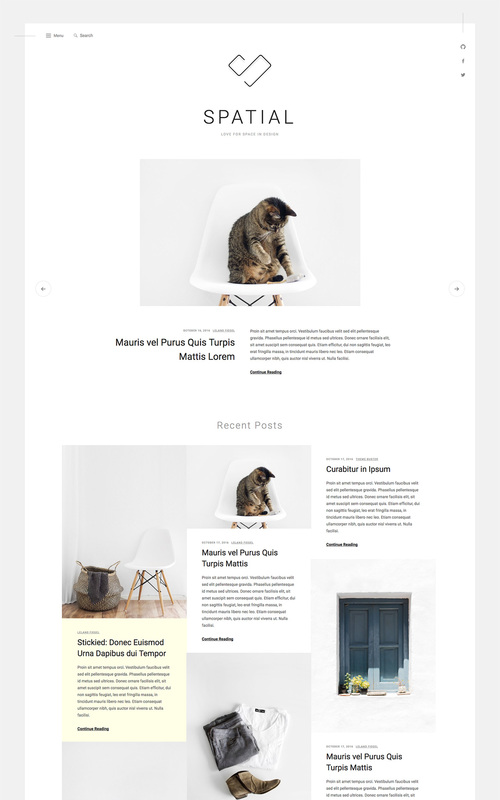 Spatial is a theme designed for photo-centric blogs, with a minimalist style. Do you have content you want to make sure first-time visitors don’t miss? Set it as featured. If more than two posts are designated as “featured,” the theme will activate a slider above your regular blog content. Spatial looks best with Featured Images set on every post. It’s a great way to give your readers an idea of the content they’re about to dig into. A prominent Social Links Menu in the top right corner gives your website visitors a way to keep up with you on preferred social networks. The footer widget area widths are 480 wide on a 1920 wide screen. Featured Images for are 550 wide by unlimited height on the blog homepage, archive pages, and search results pages. They are 840 wide by 560 height on posts for featured posts.